At the beginning, The Unwanted Christmas Tree (TUCT) doesn’t realize he is unwanted, of course. 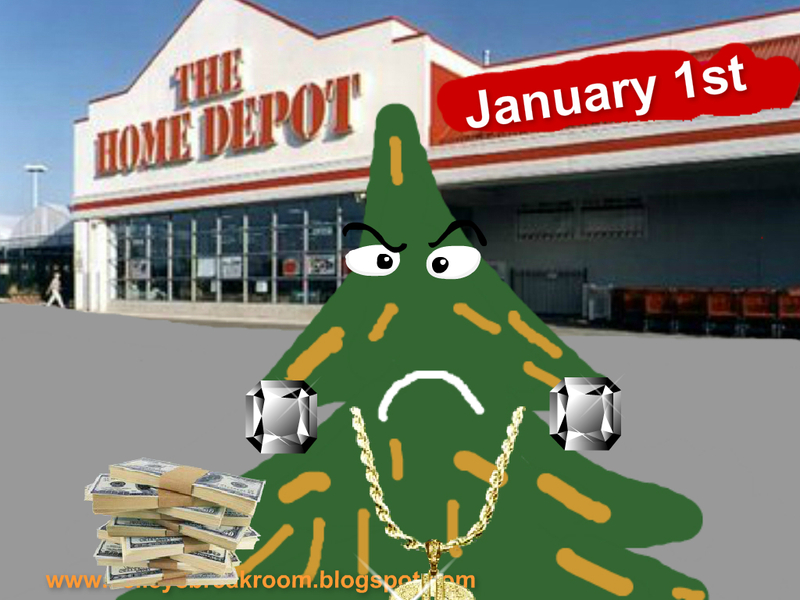 He starts the day in The Home Depot’s parking lot just like the rest of the trees. Perhaps he starts it lopsided or with a gap in the back of his head where there aren’t quite enough branches (picture an old woman who just got her hair styled in a bee hive who lies down for a nap, wakes up and finds a big hole in her massive ‘do that she has to try to fix with her comb and you can envision that gap in the tree I’m talking about), but, hey, overall he looks like the rest. He may even be the most upbeat in the group. See him front and center? Dude doesn’t realize he’s got some cockeyed branches sticking out of his bottom and that people could fit an entire watermelon inside the gap in the back of his head. He just knows he would make a great addition to a home, especially since he recently learned all the words to Feliz Navidad and he’s not even bilingual. He doesn’t get worried just yet, though. He’s still full price. He’s not even worried when Mute Tree gets taken off the lot before him. He reasons with himself that maybe some people prefer Mute Trees. Not all people love a good hearty rendition of “Jingle Bell Rock” in the wee hours of the morning, he tells himself. Godspeed, Mute Tree. They know they’re destination will sooner or later be inside a flower bed as mulch or on a beach shore as part of a sand dune (they keep their needles crossed that they get the beach), but they like to hang out a bit longer to this world and partake in the holiday festivities, if able. For one, it’s a status symbol. The earlier they get picked, the more bragging rights they reserve. Second, they love sitting on the presents and liken themselves to very large, green ducks sitting on their eggs. As the trees dwindle around them, though, their moods begin to falter. Their moods really go south if they’re parched. 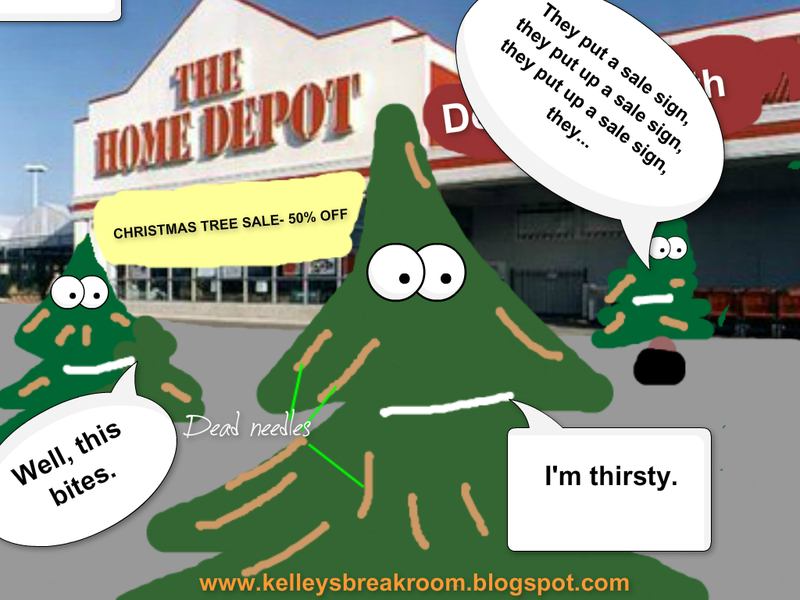 They also get really cranky when they see The Home Depot guys switch out the Christmas tree sales signs. They know that sale signs mean they’re on their way to the chipper-chopper if some desperate family doesn’t come by PRONTO. So, like the 3rd stage of grieving, they start bargaining with anyone who walks by. It’s a good thing that girl was just thinking about pre-lit trees and didn’t say anything out loud about them. Those are fightin’ words. As dry as these two trees are above, they would have found a way to hop over in their buckets to Pink Shirt and go all TaeKwonDo on her bahonkus. By now it’s obvious that we are drawing near the last stage of TUCT’s life. He has shown all of his cards to all potential buyers. He can sing Feliz Navidad, he’s a nice guy, he’s got a nice smile AND, the icing on the cake, he has no criminal record. But, that didn’t cut it. And, you guessed it, the tree that thought he was so hot at the beginning JUST GOT BOUGHT. Yep, TUCT is now all alone on the big, black, asphalt lot. Does he just lie down in The Home Depot parking lot and have a nice snooze? Does he finally just die of thirst and become firewood somewhere? Does he decide to go inside The Home Depot and collect tons of paint sample cards? He stands proud. He stands strong. He doesn’t pay attention to the stares he receives. Approximately 90% of Christmas trees left in parking lots across the United States join gangs before they can be made into mulch, sand dunes and firewood. You don’t realize the problem is as bad as it is because the trees never get caught. They normally drive the get-away car with their top branches. Now, make no mistake, TUCT up there is still a nice evergreen, but, hey, he had to make a choice. If you aren’t going to take him into your home to brighten up your windows and if he doesn’t want to get thrown into the chipper-chopper, he has to join a gang. He has no other choice. 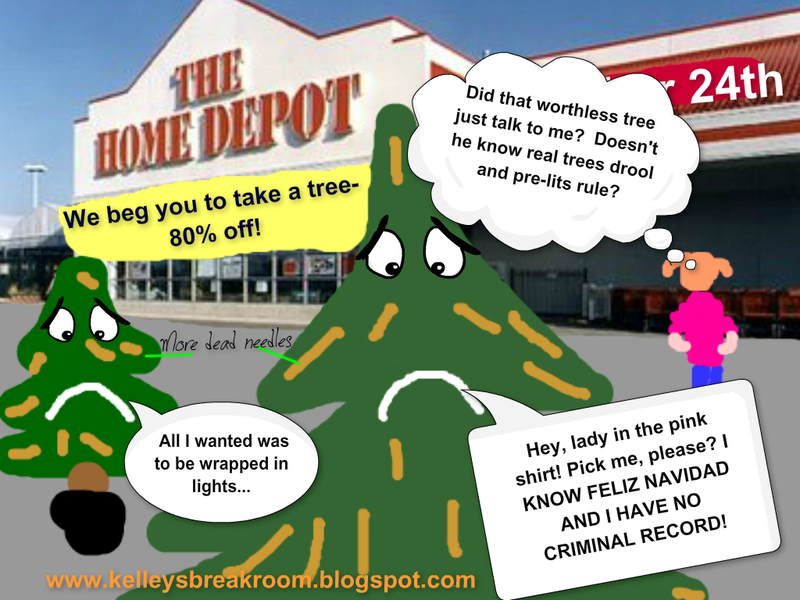 Think of this the next time you pass the fresh cut Christmas trees in parking lots while shopping for your pre-lit tree. 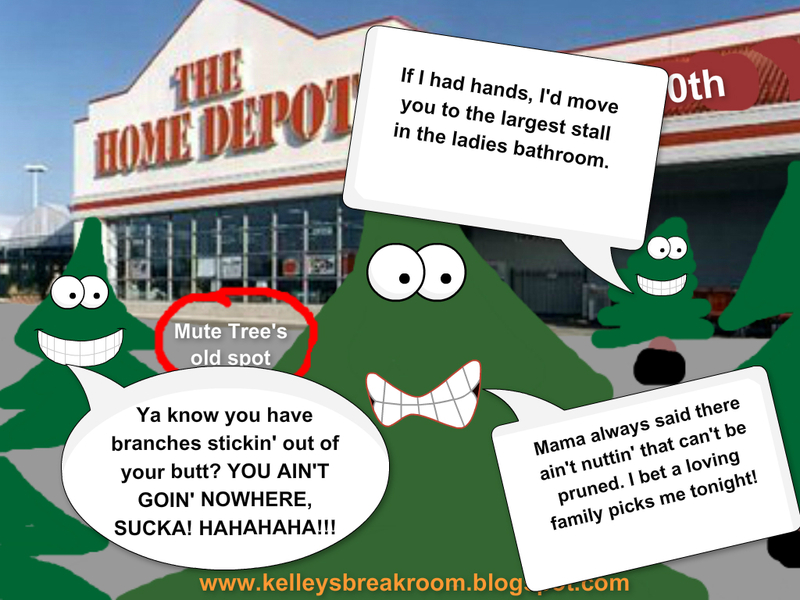 Do you really want to be the reason old evergreens join gangs? Do your part to fight crime. If humorous holiday posts are your thing, click on the funny “Ha Ha Holidays” link below, check it out and come back later this week for more to come!